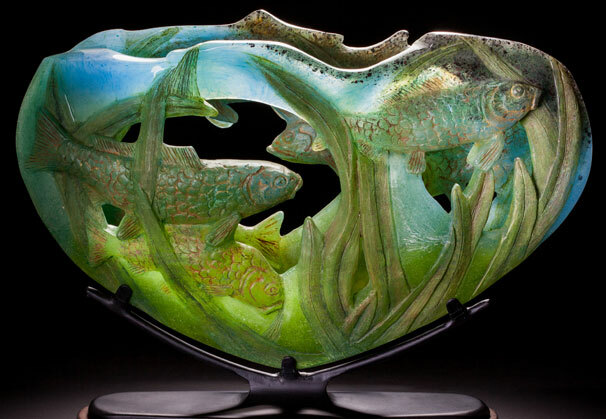 Charlie Miner started his glass career in 1973. 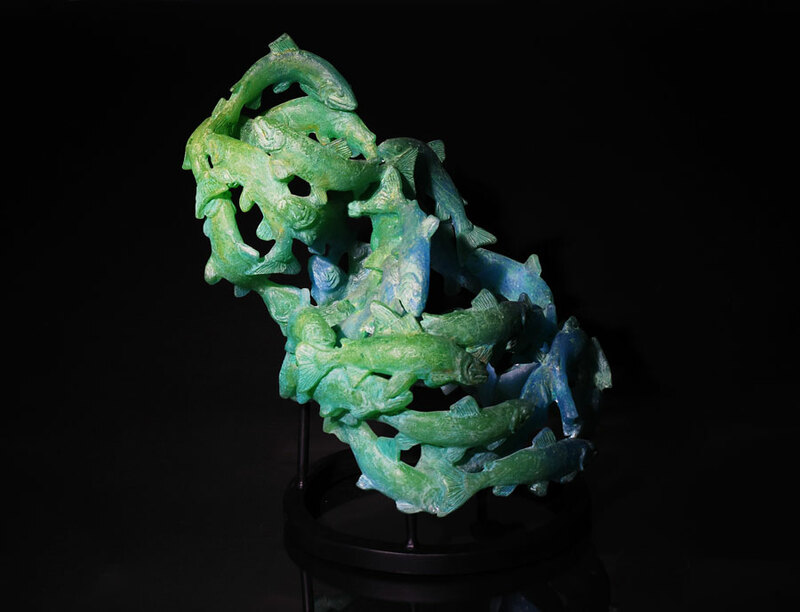 He has worked both in blown glass and most recently using his background in bronze casting to produce large lost wax cast pieces of 24% lead crystal. 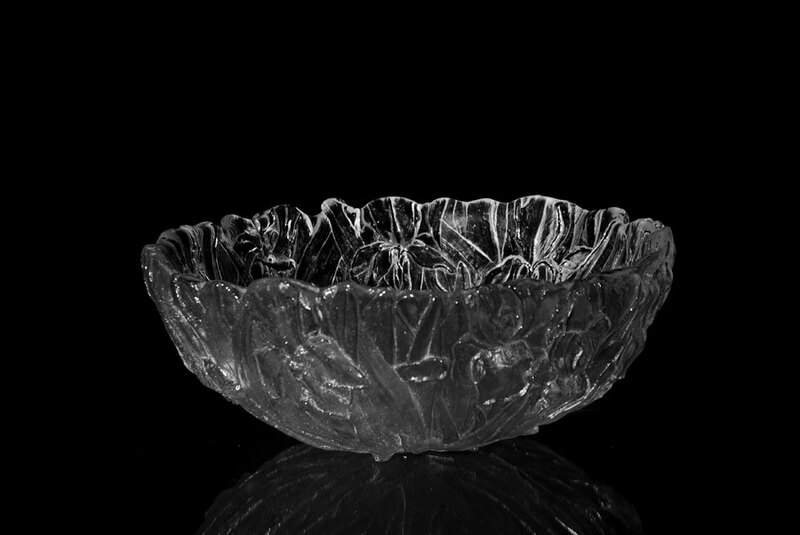 This process often gives his glass a unique texture and patina resembling stone. 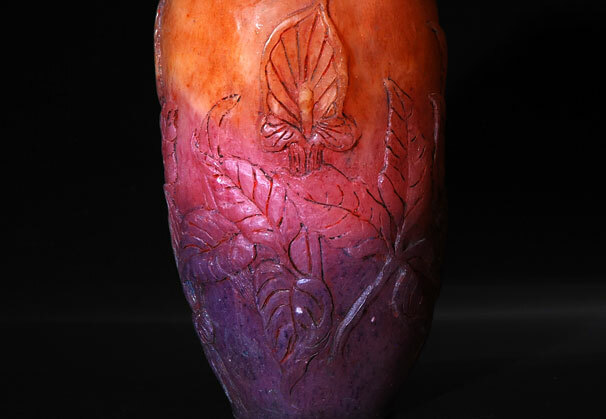 He is represented by many galleries, including Tesuque Glassworks in Santa Fe, NM, which Miner founded in 1975. 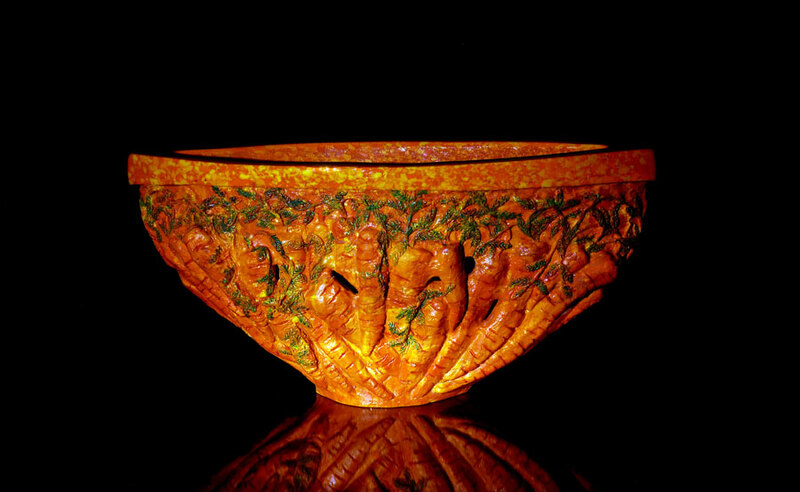 First an original is made from carving wax, porcelain or clay. Then a rubber mold is made from the original. The wax piece is then placed in a wooden form and completely covered with a soft plaster investment, being sure to leave steam hole (or air vents). Next, the wax is melted out by forcing steam through the steam holes. Then the mold is left to dry. At this point I have a large block of plaster with a negative image of my art piece inside. The mold is then placed in a large electric kiln. Next the mold is filled with glass that has been ground down into fine powder. The kiln is then gradually heated up, often reaching temperatures as high as 1600 degrees. Slowly the glass melts down throughout the piece and into the detailed negative imprints. When the melting process is complete (15-25 days, depending on the piece), the temperature of the kiln is gradually taken down. 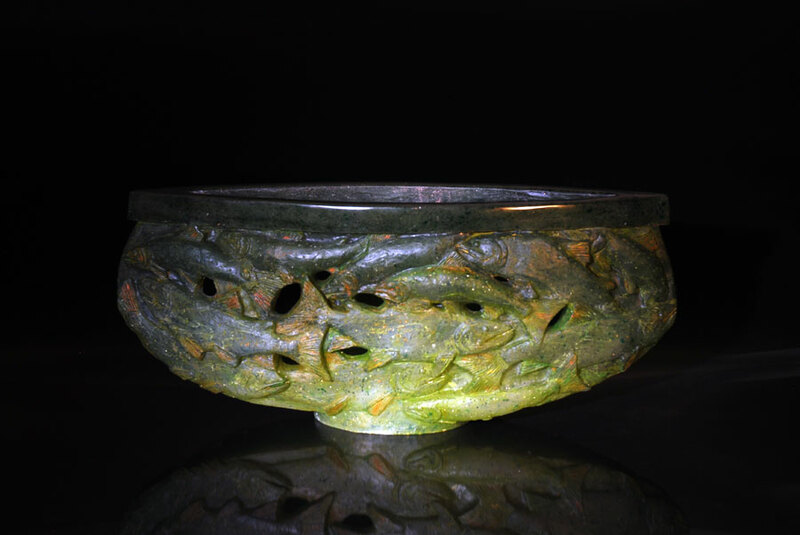 The annealing cycle of 1-2 ½ weeks allows the glass to cool slowly and evenly; therefore avoiding cracking. Finally, after the cooling process is complete, the plaster is carefully removed from around the piece. The last step is to polish the piece using small sanding blocks that have been impregnated with diamond chips (diapads). These diapads grind out the remaining plaster and other impurities on the surface of the glass. 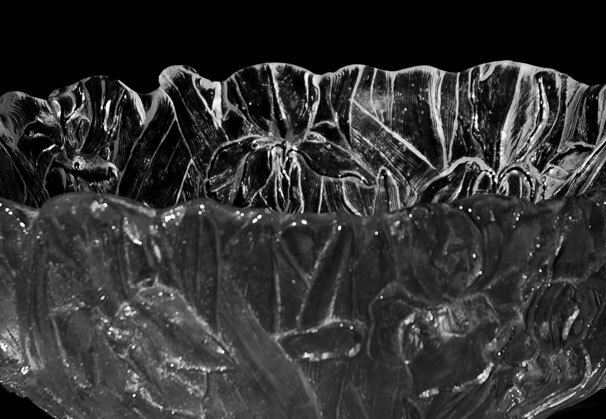 All my castings are 24% lead crystal, which sometimes gives them a unique texture often resembling stone, but still holding all of the attractions of glass. Wow! Fifty years of studio glass! 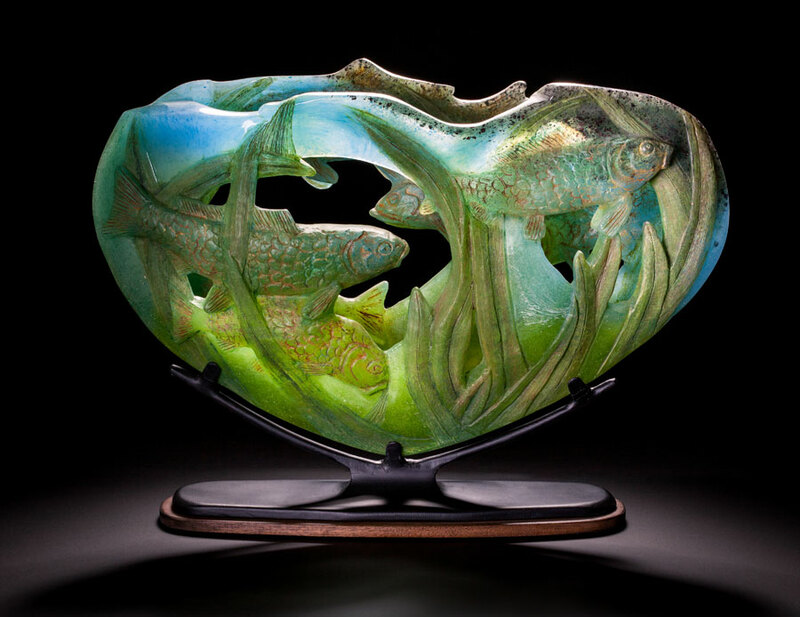 Charlie Miner regards the glass movement as a complete gift. He was always involved in the arts during his high school and college years, after which, he immediately started working at a bronze foundry in Santa Fe. In 1972 he attended a sculpture conference in Lawrence, Kansas where there was a small glass studio set up for Harvey Littleton. When he returned to Santa Fe, Charlie hooked up with Glory Hole Glassworks and fell in love with functional glassblowing. He spent the next ten years at craft fairs. 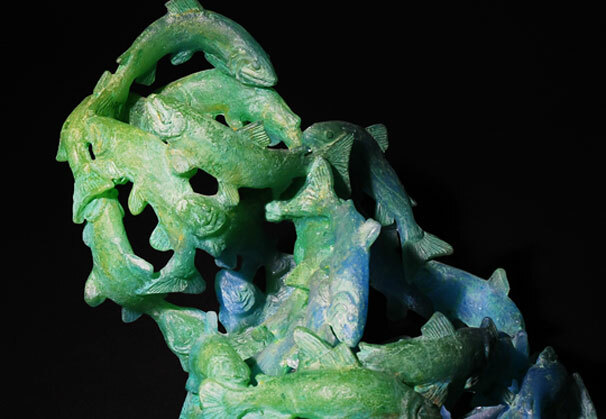 After that, he studied glass casting at Pilchuck Glass School with David Reekie and Clifford Rainey. 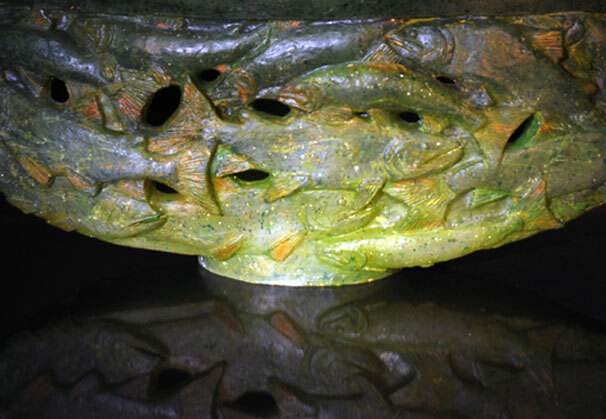 When Charlie returned home, he started combining bronze techniques with ancient glass casting techniques. He still loves it. Charlie blows glass, but his cast work has received the most critical acclaim. Both styles are represented at Tesuque Glass Works which he founded in 1975 under an old tin shed attached to the back of a now defunct Shamrock gas station in Pojoaque, New Mexico. The working studio, which has grown over the years, represents other artists who blow glass daily in the hot shop. 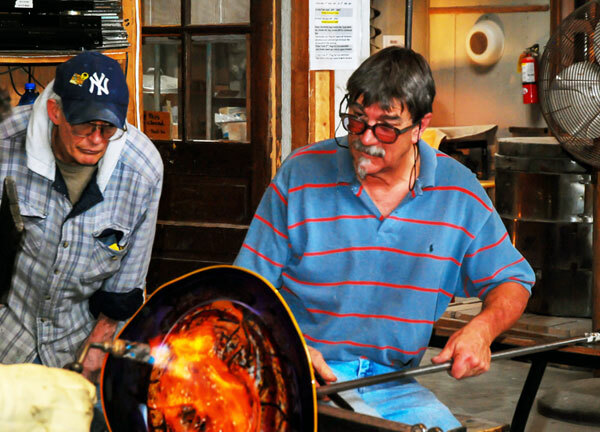 The Glass Works functions as a gallery, production studio, and a place to see and learn about glass in its various forms. 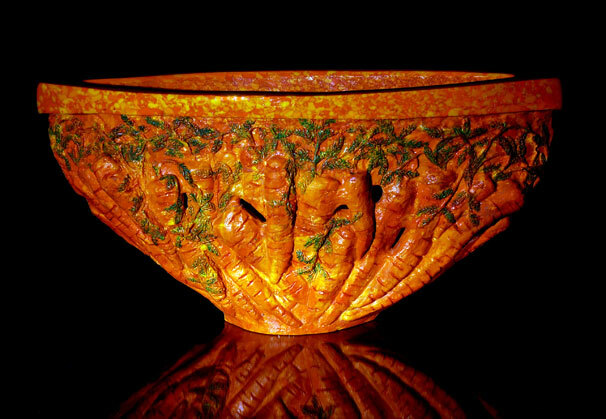 Miner’s work is represented in private and public collections throughout the United States, including the Corning Museum of Glass, New York; Fuller Craft Museum, Massachusetts; Renwick Gallery of the Smithsonian American Art Museum, Washington, DC; New Orleans Museum of Art, Louisiana; the Tucson Museum of Art, Arizona; and the New Mexico Museum of Fine Arts, Santa Fe. 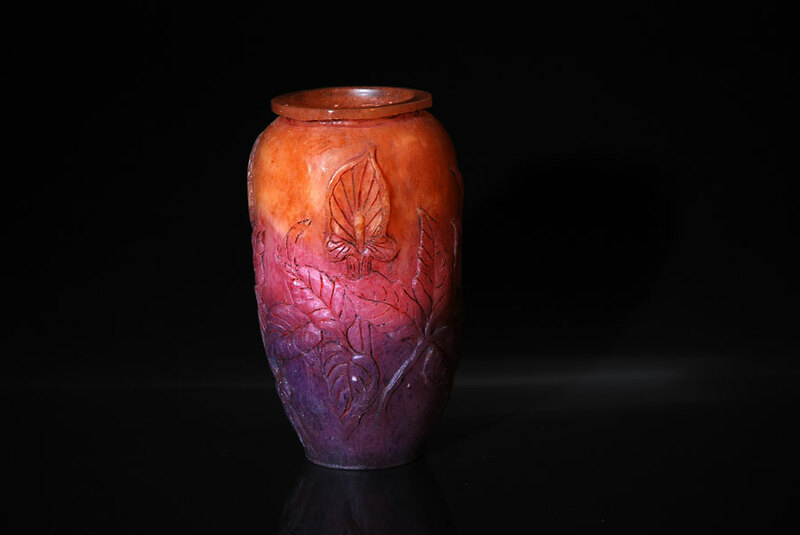 We are grateful to Tesuque Glassworks, Santa Fe, New Mexico, for providing the materials for the Artist of the Month.